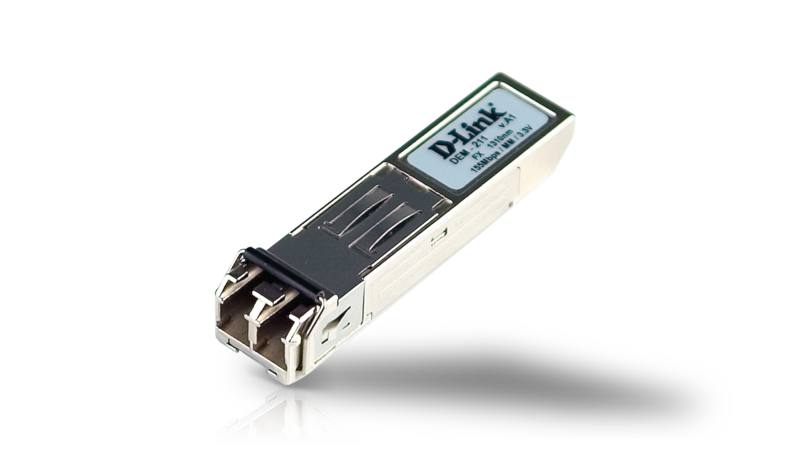 D-Link's DEM-210 and DEM-211 SFP transceivers provide a high performance solution for serial optical data communication applications. They are hot-swappable, Small Form Factor Pluggable (SFP) compliant with the Multi-Source Agreement (MSA) specification. The transceivers have duplex LC connectors and provide IEEE 802.3u compliant link for up to 100Mbps in the half duplex mode (or 200Mbps full-duplex mode) transmission for fiber cable applications. D-Link's highly integrated transceivers offer low jitter performance for extended optical links support without performance degradation. This high performance enables reliable data transfer in short-, intermediate- and long-distances for building, factory, campus and metropolitan networking applications. Previous combo-port switch designs have only provided Gigabit copper or SFP fiber-optic connectivity but not 100BASE-FX SFP fiber-optic connectivity. Switch designs like the DES-1226G and DES-3526 are of the former type. D-Link now provides 100BASE-FX SFP fiberoptic connectivity on Gigabit combo SFP ports for new switch model designs. Futher, in our effort to offer a full product porfolio, D-Link has developed the DEM-210 100BASE-FX SFP transceiver which can plug-in to the Gigabit combo SFP fiber-optic slot of selected switches to provide 100BASE-FX connectivity. The transceiver connects with certain specific supported D-Link switches. It is not for use in the Gigabit SFP fiber-optic ports found in other switches. The current list of D-Link switches that support the new module includes the following: DES-1228, DES-1228P, DES-1252, DHS-3028, DHS-3628F, DHS-3626F, DGS-3612G.